Though not the University's showcase sport, the George Mason University Football program is a popular draw on the Fairfax Campus during the fall semester. Led by Coach Matt Dyson, the team has been successful for much of its history, and has sparked enthusiasm on the campus during chilly fall weekends. Oddly enough, the Patriots do not play in Division I, II, or III. There are no scholarships for players. Football is currently a club sport at Mason. A student-led movement at Mason to upgrade the football program was gaining momentum during the late 1990s. Its members pressured university officials to effect the changes necessary to raise its status from that of a “club” to an NCAA Division I-AA program. At the same time, another group advocated for the University's keeping the status quo. The debate led to a monumental meeting of the Board of Visitors (BOV) in May 1998, where a tie-breaking vote was necessary to settle the issue. Mason had seriously considered starting an NCAA Division I-AA football program as early as 1991. At that time the University already had several Division I athletic teams, which meant that a Mason football team would have to play in either Division I-A or I-AA. Division I teams are generally more expensive to maintain than those in Division II or III, due to staffing and scholarship requirements. The University decided to pursue a Division I-AA football team, mainly because a I-A team would be much more expensive to field. Maintaining a program even at the lower level, would cost Mason an estimated $1.98 million to establish the team and $5.3 million in facility improvements. Other costs would need to be factored in, such as monetary obligations to women’s sports teams, which were required by law if Mason planned to add such a large men’s team. These costs would, in the end, have to be passed on to students. University officials calculated that it would necessitate a $200 fee increase per student to create a 1-AA team. In the meantime, a football team at the “club” level was established in 1993, and led by Head Coach Dr. Joseph Pascale, Sr. The team performed reasonably well, and enjoyed decent attendance record for home games heading into the 1997 season. However, in late October 1997, while compliling a perfect season record, Coach Pascale was dismissed. Senior Athletic Director Tom O’Connor had reason to believe that Pascale had allowed an ineligible player to participate during the 1997 season. The team, unhappy with Pascale’s abrupt termination and the University’s apparent refusal to allow the coaching staff to choose Pascale’s replacement, unanimously decided to boycott the rest of the season. While University President Dr. Alan G. Merten supported the Athletic Director’s decision, Coach Pascale believed he had been wrongfully terminated. Pascale petitioned for a full hearing before the BOV, expressing his belief that the University fired him simply because he was a strong advocate for a Division I football program at Mason, while others in the administration were not. Pascale was eventually rehired after apologizing to Athletic Department officials, although he maintained that he did not fully realize the player in question was ineligible. It was during this same time that a Student Senate poll claimed that eighty-eight percent of the student body supported expanding the football program. Seventy-two percent were said to be willing to accept extra fees to cover the costs. It should be noted that the poll only represented approximately two percent of the non-law school student population at the University. 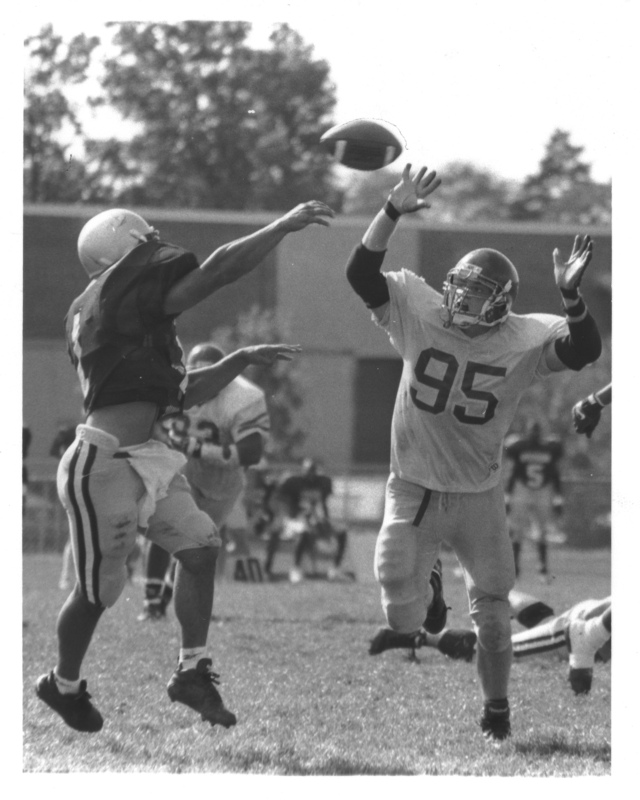 The football debate heated up during the Spring 1998 semester, as the BOV took up the issue. At the January 1998 Board meeting, consultants hired by the University estimated that a Division I-AA football program would cost the University $4.2 million a year, including scholarships for over fifty student athletes. Lacking any other way to raise this kind of capital, this cost would have to be passed on to students in the form of a $225-$250 activity fee increase per year over a five-year period. Some presenters at the meeting suggested that an expanded football program could help strengthen the University community, build school spirit, and allow Mason to better compete for talented students and faculty with schools such as James Madison University. A task force, comprised of Mason staff, faculty, students, and community members, was established to create a report on this matter and submit it to the Board by March 1, 1998. Proponents of the expansion of the football program made public statements to build support in preparation for a BOV vote. Coach Pascale and Student Government (SG) President Kimberly Farfone both expressed their enthusiasm for the football proposal. Farfone commented that she had never seen either the BOV or the President so interested in the student body’s opinion. She speculated the interest was keen because of the financial burden which would be placed on students should the new football program be established. The task force reported that current athletic facilities were not suitable for Division I-AA football, and a large overhaul of existing structures would be needed to construct an appropriate football facility. The SG debated a proposed plan that would gradually turn the “club” football team into a Division I-AA team. At a later meeting, the SG voted to endorse the proposed Division I-AA team. The George Mason University Faculty Senate, however, voted against adding a Division I team, citing academic concerns at Mason that needed to be met first. By a single vote, the Football Task Force chose not to endorse the expansion of the program. At the March 1998 BOV meeting, President Merten expressed his view that the football team expansion would be “a poor use of time and expected financial resources.” The BOV moved to delay the final vote until the May meeting in order to conduct its own study, analyzing the financial feasibility of the project. The BOV meeting scheduled for May 13, 1998 was shaping up to be the most important one of the year. Visitor Robert Lautenberg, Chairman of the Football Task Force, presented the BOV with a ten-year funding plan for the football expansion. The presentation included the proposal to raise student fees over a four-year period and suggested that as many as seventy-six percent of the student body favored the project if fee increases were reasonable. Lautenberg moved that the BOV vote to pass the budget proposal and begin work on the project. Dr. Merten then passed out a memo he had written to all Board members in attendance. The memo recapitulated Merten’s sentiment against expanding the football program, citing the extreme limitations it would place on university funds. Merten expressed his concern that funding commitments for the football expansion would take away much-needed monies from other campus institutions. Lastly, he challenged the statistical data referencing student support of the expansion. The poll did not measure whether the football project would actually increase school spirit, an ultimate goal of the expansion of the program. The vote on the expansion of the football program was one of the closest in BOV history. Six members voted in favor of the project, while six voted against. Two members of the Board were absent, and none abstained from voting. Rector Marvin Murray cast the tie-breaking vote, choosing to not approve the football program. The Great Football Debate finally reached a conclusion. At the beginning of the Fall 1998 semester some members of the student body spoke out against the Board vote, but the brief conflict eventually ended quietly. While Mason’s football team still has not achieved NCAA Division I-AA status, it still remains competitive and is a popular team sport at Mason. It has benefitted from Mason's recent sports sucesses and its continually-growing enrollment. Although it is supported on a much smaller level than other team sports on campus, football at Mason remains a source of spirit and pride. Browse items pertaining to football at George Mason.